Every lesson in God’s Unfolding Story for Older Preschoolers fits into a unit that contains either four or five free lessons. A listing of all of the units can be found on the site along with access to all of the lessons. 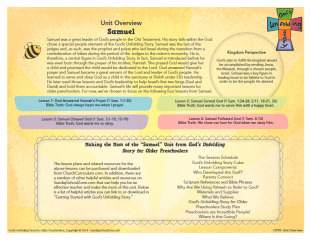 This page (below) and the downloadable and printable PDF is an overview of the Samuel Unit (OT09). You can click to access the printable PDF of the Unit Overview Page. 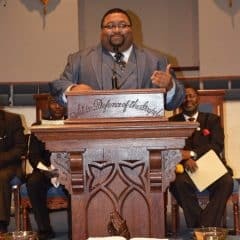 Samuel was a great leader of God’s people in the Old Testament. Samuel was the last of the judges and, as such, was the prophet and priest who led Israel during the transition from a confederation of tribes during the period of the Judges to the nation’s monarchy. He is, therefore, a central figure in God’s Unfolding Story. In fact, Samuel is introduced before he was even born through the prayer of his mother, Hannah. She prayed God would give her a child and promised the child would be dedicated to the Lord. God answered Hannah’s prayer and Samuel became a great servant of the Lord and leader of God’s people. He learned to serve and obey God as a child in the sanctuary at Shiloh under Eli’s leadership. He later used those lessons and God’s leadership to help Israel’s first two kings (Saul and David) and hold them accountable. Samuel’s life will provide many important lessons for older preschoolers. 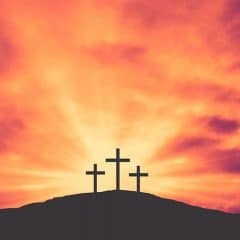 God’s plan to fulfill His kingdom would be accomplished by sending Jesus, the Messiah, through a chosen people, Israel. Samuel was a key figure in leading Israel to be faithful to God in order to be the people He desired and fulfill His calling or vocation. View a description of the specific lessons in this unit. See a list of the types of free, printable Bible activities we provide on Sunday School Zone.